If you are an engineer, a doctor, a nurse or a professional in the Philippines; then I am sure that you visited the office of Professional Regulation Commission (PRC) to to renew your registration. Renewing your professional license can be an inconvenience, especially if you have to file a leave of absence just to renew. Going to the PRC can be less of a bother if you know what to expect when you are renewing your professional license. For those who are renewing their professional license, please read the regular procedures for professional license renewal. If you in the rush of renewing your license, please read the procedures in applying for Express ID. Before going to the PRC, decide which procedure you want to use because each procedures caters for different needs of professionals. PRC offices are usually filled with applicants for new PRC License and those who are renewing their license. Also, these offices are only open during weekdays so you are forced to take a "leave of absence" from work just to renew your license. The good news is that you can renew your professional license at the PRC Renewal Centers located at selected SM Malls. These centers are open 7 days a week (including Saturday and Sunday) during mall hours. Read more about the PRC Renewal Centers at malls on my blog post. The nursing profession is one of the professions that has the most number of professionals in the Philippines. I suggest that you avoid going to the PRC during the board exam registration of nurses because PRC office is usually jam packed during those times. I usually see the queue of nurse registrants reach the sidewalks of Espana Boulevard. The large number of people will make it hard for you to move around the PRC office. 1. Application form (PRC Reg Form 003) that can be obtained from the Information Window near the entrance get in PRC central office. The form can also be downloaded from the PRC website (PDF). 2. Two pieces of passport size picture (3.5 cm by 4.5 cm). The picture should be a close-up of your face and colored. The background should be plain white. A complete name tag should be placed at the bottom part of the picture. 3. Photocopy of your recent professional license ID. In case of lost ID, you must provide PRC with an affidavit of loss. If the ID is destroyed, then you must surrender the destroyed ID to the PRC. When I first went to the PRC, the clerk don't want to accept my application and told me to go to my accredited organization of my profession to obtain a certificate of good standing. I suggest that you ask your professional organization if you need this certificate before going to the PRC. There are photo booths located inside the PRC central office. I don't recommend these photo booths because their picture, which they take using a webcam, is crappy. Four pieces of passport size picture, with “free” ID card holder, cost about 80 pesos. Please take note that you only need one photo when you are renewing your license. What I did is that I made my own passport size photo using Photoshop. I followed the photo requirement of PRC and typed a name tag at the bottom. The format of the name tag is: [your surname], [your given name] [your middle name]. You can print your picture at photo printing shops for as low as 30 pesos. You don't need to bring your own photo if you are renewing your professional license through the Express ID. PRC's Megadata Office will take the picture, which will be used for your ID. My professional license just expired, so I paid 450 pesos. Expect to pay more than 450 pesos if your license is expired for more than a year because PRC gives penalty to professionals who defer the renewal of their license. There is an additional fee for those who are renewing through Express ID. I did not encounter any fixers when I renewed my professional license. The transaction in the PRC is fast, which made fixers irrelevant. However, be conscious of possibility that there are some a people who may trick you when you are t the PRC. I suggest that you only transact with PRC employees. Renewing your PRC license is an inconvenience but not uneasy. Following the tips that I posted here will make your license renewal faster and easier. Do you have questions about renewing your license at the PRC? Please tell me about it by leaving a comment. Hello. Thank you for this very helpful blog. I am to renew my brother's license, soon, and I just would like to verify the picture with complete name tag--I thought the licensee must be holding the name tag personally--and not digitally enhanced. But since the article indicated you did resolved to this, then it follows that PRC is not so strict about it? Thank you very much. Please reply on my email soon, it is saigone_turro@yahoo.com. What the PRC actually needs is a passport sized photo with the name of the licensee at the bottom of the photo. So, it is OK if the name of the licensee is just placed on the photo using any-photo editing software. The photo-booths inside the PRC also do the same. I'm applying not to renew my license, but for my first-time application for the LET. I tried looking for sample photos of the passport size picture with the complete nametag at the bottom, but unfortunately was not able to find one. I am glad that you provided a description of the photo. I am familiar with Photoshop and can edit my own picture. Is it possible to request for a sample picture (either in this thread or via my e-mail)? (I'm nervous about the format). I'm sure a lot of others are curious as to how this custom passport photos look like. First of all, I want to say "God bless to your PRC license application. Go to that URL so you can see the PRC ID sample photo. Hi i would just like to know if anyone of you knows how much is the penalty fee of not renewing a license? My license is already expired for almost 2 years now. Thank you. I don't know how much is the penalty because it may depend on your profession. You can ask your question directly to PRC by calling their telephone number: (032) 314-0026. For the PRC requirement to obtain Certificate of Good Standing (Tip #3), can you please provide us a reference for this requirement(i.e. IRR or board resolution, etc)? We have a lot of queries regarding this and we need some basis to justify. I don't have the IRR or board resolutions that you are asking for. Please contact the PRC or the organizations for the information that you need. my cousin is a RN, and his PRC license will expire on oct.24, can he renew his prc license? hello. i'll renew my prc license this august..my question is..can i renew my license here in PRC tuguegarao? the fact that i took my examination in Manila? I am not sure if he can renew his license early. What I know is that he can renew his license on October 24 and onwards. Hello! Yes. You can renew your license in PRC Tuguegarao. There is no need for you to go to PRC office in Manila. maryanne first of all good day to prc!my problem is can still renew my miwifery lisence it was already expired yaer 2000?what are the requirements n how do i pay fof the penalty? You can still renew your license but you have to pay the penalty or fee. Penalty can be paid at the PRC office. Can one of my authorized agents could renew my lost CPA license? If so, please provide the needed requirements so i can properly instruct my agent. thank you. You need to issue a Special Power of Attorney or Authorization Letter to your authorized agent so they can represent you at PRC. Hi! Since there are already PRC satellite offices in some SM malls, will these centers accept PRC ID which is expired for more than a year? Hopin' for your quick response and thanks! Hello! Yes. They will accept your expired PRC ID because they are legitimate PRC Offices. I have request, please tell me your experience in renewing your license in these "satellite offices" once your license was renewed. No problem, I will keep you posted. Thanks! You can still renew your license. It can be done by issuing a Special Power of Attorney or Authorization Letter to your authorized agent so they can represent you at PRC. I am not sure about this but I think you can renew your license before its expiration. For a better answer, I recommend that you call the PRC telephone number: (032) 314-0026. I think that penalty will start if you didn't renew your license after one year. can i renew my gf prc id...?? ?she is in riyadh now so she cannot renew her id,so he ask me to renew her id together with her friend prc id..it will be ok if ill be the one who will renew thier prc id?? Yes. You can renew the PRC ID of your GF and her friend. You just need to have an Authorization Letter from them. Do we still need "Certificate of Good Standing" for renewing a nurses' license? If so, how do I obtain them? Is express form of licensing offered to every PRC branches in the country? and last question, how long does it usually take for an express delivery to have a license ready? You need to go back to PRC to request for another copy of your professional license. What you need is an "affidavit of loss" to get the duplicate of your license. Hello. Please ask the board of nursing if they require "Certificate of Good Standing" for license renewal. My license will expire on June 2013. I'm planning to renew it this month. When will be the release of my new license? You can get your PRC license 3 days to one week after you applied for renewal. You will get the ID at the same day if you availed of the Fast ID Service. what if i passed the nle and just paid for the registration and go home because of so many applicants and decided to go back but unfortunately unil now haven't go back for the next process?? i passed last july 2011 and i still have the receipt please advice me what to do,what to bring and when to go to prc? tnx in advance..
Tell the PRC about your situation. Is there any way that I can find out what my license number is? I lost my PRC ID (my wallet was stolen), and was trying to accomplish the requirements needed in order to have it replaced. I had acquired an Affidavit of Loss, and was about to fill out the PRC form (Form 003) when I found out that the license number is needed. I do not have a photocopy nor photo of my license (big mistake on my part), and the Verification Service on the PRC website can only tell you if the person is licensed or not, and not the license number. The PRC might be district and will not provide information via telephone. Bring Government IDs when you go to PRC. They will require a valid identification to ensure that you are the person who own the license number and not someone who is fishing for info. Hello. Nice blog. I have a question, can i renew my license in advance? my license will expire this September 2013. I don't think I can renew it on that time since I'll be leaving the country mid this year. Hi! My license will expire this January 2013. I lost my ID a few weeks ago but I still have the photocopy of it. Will they still renew it even without the original ID? I'll go there a day after its expiration date. Do you think I still need an affidavit of loss even if my ID will expire soon? Thank you for your help! You don't need your old PRC ID when you renew your license. Just bring the requirements posted by the PRC and then you're OK.
Tell them that you want to renew your license. Don't tell them that you lost it. Wow, this is one helpful site. I have the same situation right now. Now I know what to do! Thank you for helping us! Keep up the good work! God bless! This blog is very hwlpful. Thank u for this coz im in samr situation too. However what made it diffetent is that before i lost my id, i was able to renew already in 1 of sm satellite. Now my dilemma is that i need an id soon beforr i leave for work in ksa. Can u please advise whay to do? Hi, im living in the US and my license expired 2 yrs ago. If i send my sister to process the renewal of my rn license, can she apply for an express ID renewal for me? If yes, whT are the requirements and the procedures? She can apply for the renewal of your PRC ID through the express ID System. hi do i really need to bring this certificate of good standing!? i don't have an idea where to get this...pls help! It depends on the association of your profession. Some of these associations require certificate of good standing before the professional can renew your license. You can ask the PRC or the association if the require the certificate. hi..can i still renew my prc card even iy was been expired for more than 16 years already? Hi! I got my prc card 17yrs ago and haven't renewed it eversince. Can I still renew my license? I also got married I may need to change my last name too. I just found out too upon checking and verifying my license at prc online services there's a typo error on my name. What should I do? Thanks! You can still renew your license but be prepared for the cost because PRC might ask you to pay because your renewal was too delayed. For the typo error, all you have to do is to inform the PRC so that they can make the necessary correction. The information that you needed can be found there. I have a photocopy of my License but I don't have the original ID. Do I still need to have a affidavit of loss? Old PRC ID is not surrendered when you are renewing your license. Thus, there is no need for you to make an affidavit of loss. Hi i passed the nursing board exam way back 2010 but i wasnt able to apply for the license. Will i still be able to apply for a license? Yes. You can still apply for a license Cleo. Just make sure that you still have the necessary documents for PRC License application. Hi I want to get a replacement prc id which was stolen along with my whole bag. I do have a copy of my scanned id. Is it necessary or needed to get an affidavit of loss? Can I renew it to any sm malls? If you are planning to get a copy of your PRC ID then you need an affidavit of loss. You don't need n affidavit if you are renewing. And yes you can go to PRC office in SM malls for renewal of PRC ID. hi, my PRC license expired 2 yrs ago, if i will do my renewal at SM mall, how long will it take to get the new PRC card? You can get your PRC ID after a week, if you applied at the PRC office at SM malls. That is the official announcement. However, I receive a comment saying that the PRC office in SM told her that she can get the ID after 4 months. It means that the PRC is not consistent. Please ask the clerk at the PRC office where you will renew your license for a better info. Hi there! thanks for the infos here. I was just wondering, i am living in Canada and i'm here in Manila for a vacation. Last time i renewed my PRC license was 2005 and the expiry date is november 2008. Can I still renew my passport at SM PRC satellite even if it is 4 and a half years expired? or should i go directly to PRC main office? does anybody have an idea how much is the penalty for this? thank you! Is it passport or PRC ID? Yes you can renew your PRC ID at PRC office at the mall. Sorry but I don't know how much the penalty will be for your case. One thing you should consider is that the organization of your profession might ask for membership fees from the previous years. Would like to ask, what is the process for renewing nurse license with change name (single to married) and late renewal? My license expired last Y2011. Does satellite office accept this kind of transactions? Also, do you have any idea how much will it cost? Satellite offices of PRC accepts processing of PRC ID renewal and change of name due to marriage. Please read my blog post above you'll have an idea about the process of renewing your ID. Tell the PRC clerk that you are also changing your surname because of marriage. You must bring an NSO authenticated marriage certificate. How long (usually) does it take for a license to be renewed? Does it take months? Processing of PRC ID normally takes 7 working days. If you availed of the PRC Express ID then you'll get your PRC ID within 24 hours. hi i am a first time LET exam taker and have passed the exam. my problem is can i claim my prc id in zamboanga? i filed the application in manila. can I request to send it here in zamboanga? manila is too far for me. You should've applied for PRC ID delivery when you applied for PRC ID in Manila. I suggest that you go to PRC-Zamboanga and ask them if they can help you get your PRC ID in Manila. Is FAST ID service in PRC Manila available for teachers? Fast ID is available for teachers. Ur info. is very informative, I got a feedback from my mother that a renewal at this moment costs me a month release? She said it was a chaos in PRC, and info. from 1 window to the other is incorrect. She even asked for an express lane for the PRC renewal of license...but there was no express lane??? Then i read somewhere that from March 4 this year it had been approved ??? which is which? hope you can shed more info. thank you and hope to hear more ! Can I renew my PRC earlier, because I always renew my PRC every December. Can you give us the list of SM malls wherein I can renew my PRC. I'm from San Mateo Rizal. Can I renew my PRC earlier than the usual date. My PRC will be expired on December 2013. Can you give me a list of SM Malls where I can renew my PRC. I'm from San Mateo, Rizal. Is SM Malls in Cubao or Marikina is accepting renewal for PRC? I think you can renew your license earlier than the expiration date placed on your card. SM Marikina has a PRC satellite office. Can i renew my teacher`s license even i am here in abroad,,what are the steps or requirement? Thank you so much,,i am hoping for your responce. Would like to ask, has anyone tried to renew PRC license in SM Masinag or SM Marikina? I haven't tried renewing my license in a PRC office in SM Malls. I hope other commenters will share their experiences. One thing that the commenters complained about PRC offices in the malls is that it took more than a month for them to get thier license. Hi... Just want to ask if how many days before you got your New id? I applied in the PRC - Manila office and I got the ID within the week. May I know if I can scan my authorization letter for my PRC id to be renewed by my sister in the philippines coz Im here in qatar? do I still have to send her a passport size picture? hello. i would like to as if i can still claim my prc ID wherein i lost my claiming stab? Is there any penalty? thanks! I think you can scan the authorization letter. You must make sure that the scanned copy will be clear. You also need to send your passport sized photo. You can also send the photo via email. You can still claim you license even if you lost the claim stub. There's no penalty but you'll take more steps because you have to prove your identity by showing a valid ID. if i will renew at prc for express id, can i give my own printed picture or is it necessary to take picture from their camera? You really need to have your photo taken by the PRC if you want to avail of the express ID. Ask ko lang if ano mangyayari sa license na di nakuha kasi im a criminologist i passed last november 2011 then i applied for my license card tapos sabi ng PRC balik lang ako after 2 weeks kaso di ako nakabalik for the reason na malayo ang office at financial problem din po..hope matulungan nyo po problema ko..needed help po talaga ..
More than a year mo na pala di nakuha yang PRC license mo. Posible na idinispatsa na ng PRC yan. Maganda mong gawin ay tawagan mo ang PRC at tanungin mo sa kanila kung anong nagyari sa ID mo. Please call this telephone number: (02) 314-0026.
hi..need p ba isurrender ang old prc id pra mkpagrenew ng license and makakuha ng new prc id? hi gud morning, it is possible to renew the 10 years expired civil engineer prc license and what are requirements to comply. hi. i would like to ask if i can renew my license at the SM malls even if it is late already, around two months? yes. You can renew your PRC license at the PRC satellite offices at the malls even if your license is expired for more than two months. Hindi po b ngdodoor to door delivery ng license ang prc.. specifically tuguegarao branch? Ang alam ko lang na nagdo-door to door delivery ng PRC ID ay yung main office nila. Hindi ko po alam kung magkano yung SPA. Maganda na authrization letter ang gamitin mo since mother mo naman maglalakad ng lisensya mo. hello. tanong ko lang,pwede ba ko makapagrenew ng license in prc davao though i registered in prc manila? and also, i wasnt able to get my certificate of board rating and board passer in prc manila when i passed the board last 2011. can i get them in prc davao? thanku. Mas mabuti po na nag tanungin ninyo ay yung PRC-Davao. Heto po ang telephone number nila: (082) 234-0007 to 08.
hi i would like to clarify if there is a specific requirement in renewing license for those who are not practicing their profession ? There is no specific requirement in renewing license for those who are not practicing their profession. Hindi ko alam yung sagot sa iyong tanong. Mas mabuti po na tumawag na lang po kayo sa PRC. here is their telephone number: 310-0026 & 735-4476. Hi po ask lng po sana ako kung nawala ko yung original board rating ko and mg rerequest ako ng copy of board rating certificate anu po ung mga requirements? Thanks! I don't think that you need an affidavit of loss since you have a photocopy of your PRC License ID. Thanks for your response, yes im still here in australia. im planning to send one of my relatives to renew my prc id. That is not good. I think that you better ask PRC on what to do. Heto po ang telephone number ng PRC Manila: 310-0026 & 735-4476.
hi! my license got expired 2012,then i got married april 2013. ngaun q lang sana irerenew at magpapachange status na din ako. what is the fastest processing time po? sabi kasi 3 months, di na po ba pedeng iexpress yun?kasi po need ko na sana xa sa promotion sa january.... pls. po? thanks! Hello nawala po yung prc id ko nasama sa nakaw..sa cebu po ako nag.apply okie lng po ba magprocess sa iloilo pra sa bagong prc id kong nawala?ano po yung mga Requirements..HELP ME!.. Masyadong matagal yung 3 months. Sa PRC - Manila office ay mga one week lang ay nakuha ko na yung PRC ID ko. Kapag Fast ID naman ay within 24 hours makuha mo na yung ID. Naku, tawagan na lang po ninyo yung PRC Iloilo kung papayagan kayung magrenew ng PRC ID duon kahit sa Cebu kayo naka-register. if your not practicing your profession and you'd like to renew your card. what sort of certificate are u referring to. There are professions that have stricter process in renewing the PRC License. PRC asks for certificate of good standing for such professions. I suggest that you ask PRC about this para malaman mo kung kasali yung profession mo na may requirement na certificate. Good day po. Pwede ko po ba irenew ang license ko sa prc manila though na i renew ko na po ito sa sm makati last dec 18? Now ko lang po kasi nalaman na may express id po sa prc manila. Sabi po kasi sa sn 2 to 4 months ko pa po makukuha yung license ko eh lalabas po ako ng bansa by january. Hindi lang ikaw ang nag-comment na mabagal mag-renew sa mga PRC offices sa mga SM malls. I think you can renew in PRC Manila through the express ID. Yun nga lang mado-doble ang bayad mo. Happy new year! Just want to know if my friend can renew her license in SM malls? She is a medical technologist and her lic expired in nov.9, 2010. How much is the total penalty if it is late for almost 4 years? Happy new year! Just want to know if my friend can renew her prc id in SM malls? She is a medical technologist and it expired in nov.9, 2010. How much is the total penalty if its late for almost 4 years? Please can you reply in my email ...mandap_noemi@yahoo.com...or to my fb account ...noemi mandap. Thank you very much in advance! Renewing the PRC license should be easy at all times regardless if it happens during the registration of nurses or whichever profession. Last time I went there in Dec 2012 it was horrible. I think they can speed up the process by removing some of the steps. The queue was just horrible and if they can tolerate giving that kind of service I think they are just as incompetent as any typical government office who has the mindset that "you people need something from us so shut up and queue for one day 'cause we don't care!" good day my friend renewed her prc i.d but the prc said she was tagged with legal what does it mean? They said she can get her i.d for 4 m0nths. Any help please because she really need the i.d and the prc said she cann0t request any paperz in the prc. Maybe somebody sent a complaint against your friend to the PRC. Another possibility is that her namesake has a pending case with the PRC. The only thing that she could do is to ask PRC of the reason why her PRC documents are being withheld. 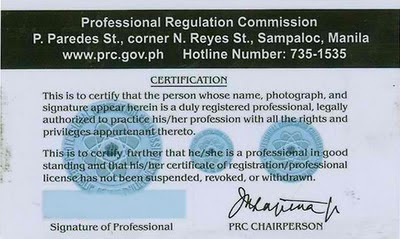 Kailangan pa po ba ang PRC ID for renewal of license?okay lang po ba ichange yung signature ng Professional sa PRC ID?iba doon sa signature na ginamit during registration of License? Bakit magkaiba 'yung signature? Nagkamali ka ba ng pirma noong nag-register ka? You don't need the actual ID. Kailangan mo ay 'yung photocopy ng ID mo pero maganda rin na dala mo yung PRC ID when you renew. Hi, I lost my PRC ID, however it's due for renewal na..is it okay if dumiretso nako sa renewal process and wag ko ng i declare as lost? I think you can go directly to renewal of your PRC license basta ba meron kang photocopy ng expired PRC ID mo. Gumawa ka na lang ng affidavit of loss kapag hinanap sa iyo yung lost ID. I am not sure if there's Fast ID in Legazpi. What I only know is that the Fast ID is in the PRC main office in Manila. hi! good aftrenoon po..magtatanong lang po sana ako kung pwede po ba mag apply ng License kahit saan?nagtake po kasi ako sa zamboanga tapos di na po ako nakapag apply kasi po byahe ako ng byahe..pwede po ba ako kumuha dito sa cebu? Hindi ko po sigurado kung pwede kasi yung mga records mo ay nasa Zamboanga. Magtanong na lang po kayo sa PRC-Cebu. 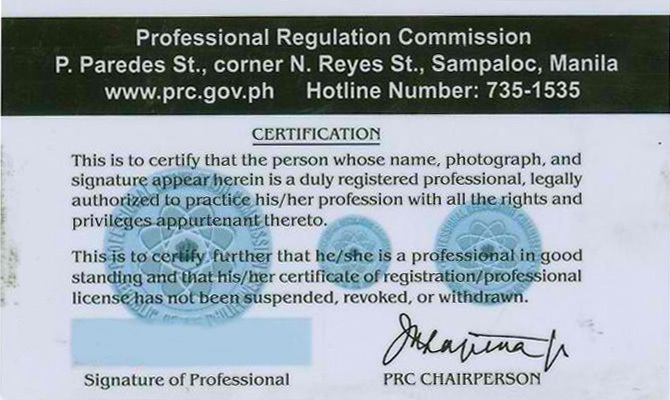 Hi Writer, I passed the Board Exam last 2010 and I got my PRC ID but NOT my Board Rating Certificate. Hindi nila naisama dun sa release nung ID :( I still have my receipt. Paano po kunin yun? What are the requirements? Thanks! I think that you can still claim your PRC license even if you lost your claim. Just tell the PRC about it and prepare necessary documents, and maybe your receipt of your payment for your PRC License renewal. Certificate of good standing may be obtained from the Nurse Association. I am not sure kung pwede sa association ninyo ng representative. Tanungin mo na lang muna sila. hi,good morning. i want to ask if i can claim my PRC ID, same with my board of certificate,certificate of good standing and board of rating here in Manila, but im registered at Iloilo? hi,good afternoon, my follow up quesstion is if ever po na hindi ko makukuha sa main office pwede po ba na ang mother ko na lng ang mag claim sa Iloilo? anu po ang mga requirements to claim? I'm not sure kung pwede mong kunin sa Manila yung PRC license mo at iba pang documents kung sa Iloilo ka nag-register. Mas mabuti na tawagan mo ang PRC para d'yan. Tungkol yun sa license renewal pero sa tingin ko ay pwede ding gawin yun sahindi renewal. Pwede namang baguhin yung signature. Yun nga lang mukhang walang procedure para duon ang PRC. Magtanong na lang siya sa isaang abugado at tiyak may maayos na sagot yun. Ano po bang tawag dun sa late renewal of expired PRC id? Kahit late yan, renewal of PRC ID pa rin ang tawag. my license expired last april. sa sept pa ako makakauwi sa pinas. it would be 4 months expired on that month. may idea po kayo kng monthly ba ang payment sa penalty or yearly? Yearly po ang penalty, kung meron mang penalty. Hindi ko po alam yung exact price. Pero sa tingin ko regular fees lang ang babayaran ninyo. Im planning to renew my license at malls, may I ask if they require the ID too or photocopy only? I lost my ID actually. The requirements at PRC branches in SM Malls are the same in the regular PRC offices. I think that they only require photocopy of the old IDs. However, it is better that you bring your old PRC ID just in case that PRC ask for it. Hi, may expiration ba ang Certificate of Good Standing? Depende yung expiration sa association ninyo. Pero sa PRC ang hinihingi nila ay yung latest certificate of good standing. Pwede mo pang i-renew yan kahit 5 years expired pero malaki na yung babayaran mong penalty. Pwede mo na ring isabay pagkuha ng mga documents na nabanggit mo. Pwede mo pa ring i-renew yang ID mo kahit 2 years expired. Kung lost ID ka naman at hingin sa iyo ay maggawa ka na lang affidavit of loss. Sa tingin ko ay wala nang fast PRC ID ngayon kasi within the day na makuha yung PRC ID kaapag nag-renew ka. Hi, just want to ask what should i do. I passed the NLE last Feb 2009 but I never applied for license. I am planning to get anew one but I dont know where to start, please help me guys! I suggest that you follow the regular PRC application process. You can get some info about that in the PRC website. Pwede pa ba magpalit ng Signature after makapagparegister? Hindi ko alam yung procedure sa pagpapalit ng signature. Ikaw ba ay kakakasal lang na babae? Kung oo ay baka pwede na dun yung change of name sa PRC license. My PRC Teacher's License got expired last 2007. I was not able to renew it since then. Can I still renew it. Is the process is the same? How much will I pay for that? ask ko lang if panu ko ma claim ang prc i.d kung nawala ang receipt ko.. Yes. You can still renew your license and the process is the same with those who renew on time. Tungkol namn sa kung magkano ang babayaran mo ay depende na po sa PRC. Ang pinakamabuti mong gawin ay magdala ka na lang ng valid ID at yun ang gamitin mo as proof identity. Ipaliwanag mo na lang sa PRC na nawala yung claim slip mo. Ask ko lang po if I can still renew my PRC License for Civil Engineer which expired for 5 years ago now? The reason po na di ko na-renew is OFW po ako. Thank you. Hi! Thanks for this helpful blog of yours. I just want to ask if is it possible to renew my PRC ID for Civil Engineer which was expired 5 years ago? Thank you in advance. You can still renew your PRC license kahit 5 years nang expired yan. In fact, meron akong kaibigian na 5 years na ring expired ang license niya pero na-renew nya pa.
Pwede pang mag-renew kahit 6 years nang paso yung PRC license mo. Regarding naman sa refresher course, I suggest that you ask the PRC about it. hello sir for ofw like me who did not renew prc license for more than 5 years but working abroad as a nurse is it considered for ofw not to take refresher course... they must give considerations for registered nurses who are actively working abroad as ofw. Thanks and God bless. Hi! I passed the board exam last 2010 but i wasn't able to apply for my license. Can i still apply for it? I don't know the answer to your question. I suggest that you call the Nurse Association directly. You can still apply for PRC license. Hi! Do i need to submit affidavit of loss for my lost and expired teacher's license/ID? Or is it only required if valid pa yung ID? Please advise. Thanks. Affidavit of loss is required if you are asking for a replacement PRC ID just in case that you lost your ID. hi.good afternoon. i would just like to ask if i could get my prc id for the initial registration and at the same time,renew my license?my license will expire this month end.would it still be possible to renew it next year?will i be charged of penalty by renewing next year?what are the requirements if i renew my license w/ change status because i was just recently married. You can renew your license next year but subject to penalty. As for the requirements, I suggest that you read this post because it has details on the requorements and other things when renewing your PRC license. Hi! i am currently in the UK and i wanted to renew my nursing license, my license expired last 2012 and until now i haven't renew yet. my question can i just send a scanned documents to my parent in philippines and they will just going to print and submit to prc? and also how much is the penalty per annum?.. thank you for you time to reply.. I think you can send the scan copy for the renewal of your license. I cannot give you the penalty amount per annum because I do not know it. I suggest that you directly ask PRC about it. Naku Ella. Malamang na-forfeit na yang ID mo kasi mag-3 months na. Mas mabuti pa tawagan mo yung PRC office para ma-confirm kung ano na ang nagyari sa ID mo. Pwede po ba mag change ng signature? Ano po kaya procedure? Mas mabuti po na sa PRC nyo na lang po itanong yang tanong nyo. Hi! I have a pending ethics case with PRC, actually it's been more than a year since nung final hearing and up to now, wala pa din akong na-re-receive na resolution about the case. Anyway, my license has expired and I need to renew it and I just want to ask if do you think it would help if I get a "certificate of good standing" from PRC para makuha ko license ko. Based from experience kase, I'm still able to get the COGS kahit may pending case pa din ako kaso sabe nung kasama ko sa ethics case e nahirapan daw siya to renew yung ID niya last year and buti na lang may kakilala sila sa loob ng prc to help him. I know this is not your forte but I just need a 3rd party opinions. Thank you so much! Hi. I don't know how to answer your question. Maybe you can ask your friend na tulungan ka mag-renew ng license. I am not sure if COGS will help you since you already have a ethics case record with the PRC. hi... my license expires on december 2017.. just want to know if i could renew my license as early as march 2017? hi... my license expires on december 2017... just want to know if i can renew my license as early as march 2017..
Hi. just want to ask if okay lang palitan ung signature sa PRC Id? Ibang signature dun sa tatlong specimen na pinapirmahan nung unang beses na kinuha? Di ko pa po kasi napipirmahan ung PRC id ko since i am planning to change my signature. Magkakaproblema po ba ako sa renewal nun if ever? Thankyou!